The six manufacturers say they are reacting to consumer demand by removing Bisphenol A (BPA) from their bottles. But they will continue selling bottles containing BPA in the UK, a decision which has angered campaigners. The Food Standards Agency insists BPA in UK plastic products is "well below the levels considered harmful". The chemical is widely used in plastic manufacture and is commonly found in food and drink containers. 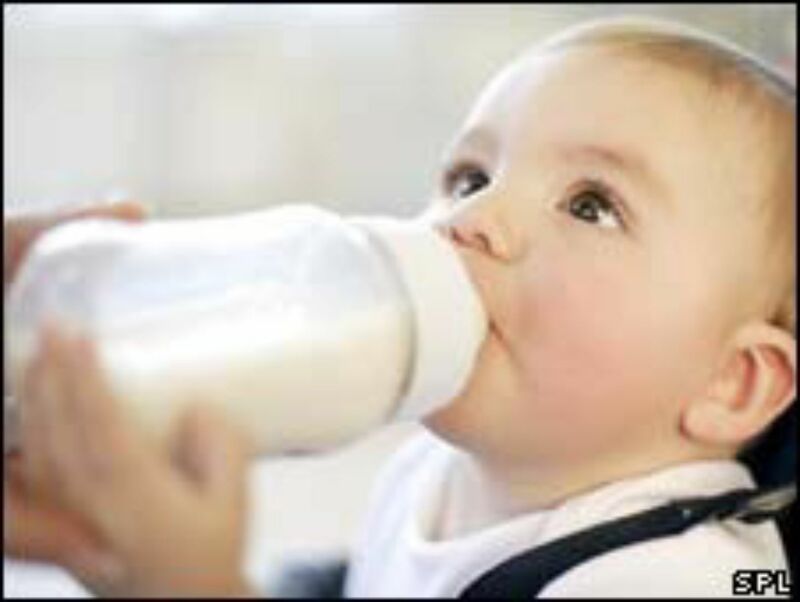 There has been growing concern about the possible effects of BPA leaching into babies' feed when bottles are heated. The current advice for parents is not to pour boiling liquid directly into bottles, not to microwave them or use scratched or worn ones. Dr Iain Lang, who led the study, said: "There is not enough to provide us with the evidence to say there is definitely a link, there is definitely something going on. "But in addition to some of the previous work that has been done looking at younger children and looking at animals this does increase the likelihood that there are problems associated with BPA." In 2008, Canada formally declared BPA a hazardous substance and announced plans to ban the import or sale of bottles containing it. Now six of the leading manufacturers in the US have voluntarily withdrawn it, but only for domestic sales. Belinda Phipps, chief executive of the National Childbirth Trust, said: "It's time the companies in the UK followed suit with what the companies in America and Canada are doing. "We shouldn't have bottles on the market that leach BPA. Parents would like to choose not have BPA in their babies' feeds and they don't find that choice easy right now." The US Food and Drug Administration says it is reviewing new information on BPA, while in Britain, the FSA says it has looked into the potential risks and found exposure levels to be well below that considered harmful. Nevertheless, Dr Howard Stoate, a member of the Commons health committee, said the American companies had made the right decision. "This chemical has been called into question," he said. "More research clearly needs to be done, [but] as a precaution I think these companies are right to withdraw it and I would like to see the FSA in this country looking hard at the research and taking the view that until we know the full truth we ought to be very cautious about these chemicals." The chemical industry says BPA is one of the most extensively-tested chemicals, and new EU legislation will ensure its safety. But the major UK retailers of baby bottles do stock BPA-free alternatives and one leading manufacturer, NUK, has bowed to pressure and removed BPA from all of its products. Steve Elliot, chief executive of the Chemical Industries Association, said: "There's been lots of work done, whether it's been by the Food and Drug Administration in the States, whether it's by the Food Standards Authority at a European level or the FSA in the UK. "Lots of data, lots of research, lots of sampling and none of those tests suggest that there is a risk to human health."